A debacle. I could very easily end the review of the match there. Quite happily I would pack all memories of this derby in the part of the brain that holds information never to be required again, such as the Melbourne Heart career of Vince Grella and anything learnt in a post-year 10 maths class. Historically the Melbourne derby has been of incredible importance for our club. 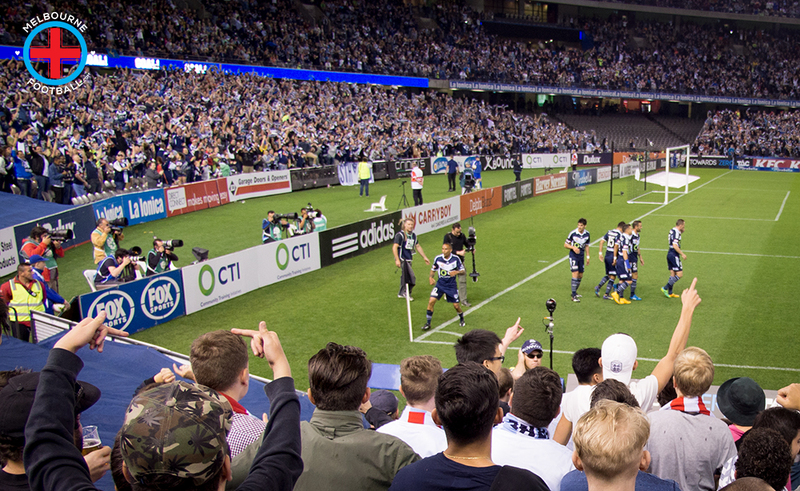 It was a real chance to show our mettle against a club with more resources and an increasingly ironic name in Melbourne Victory. These circumstances only amplified the usual euphoria associated with winning a cross-town derby and with the last derby resulting in a 4-0 win for the mighty Heart (and a brutally pleasant hangover for yours truly), this match had been looked forward to since the fixtures were released months ago. Seeing the usual pre-derby faces at the pub and on the march to the ground beforehand brought back great memories of past successes and suddenly irrelevant full-back concerns evaporated in a sea of pre-match booze. This was the derby after all and no matter what the circumstance, if there was one thing Melbourne Heart could do, it was lift when faced with the other mob that we share this great city with. Despite generally hating Etihad stadium, it was impossible to deny the great atmosphere produced by walking into a sold-out 45,000 seat stadium. The presence of several Manchester City supporters groups (and the occasional Gallagher brother lookalike) in the top tier only added to the atmosphere and it is something that we will hopefully continue to see at future matches. While the takeover has been unquestionably controversial, the way that both local and overseas-based Manchester City fans have embraced the club has been a big positive. They clearly love their club and the fact that the also share a city with a shouty attention-seeking Brother means that they know the importance of banding together for derby matches. The first half started well enough with David Villa causing Melbourne Victory all kinds of problems as they struggled to deal with one of the most accomplished players in footballing history. Similarly, Damian Duff was finding plenty of space and was displaying the kind of drive that has already made him a hero among the fans. With Villa and Duff causing most of the headaches for Victory, it was not surprising to see us take the lead. The surprise did come however, from the avenue from which the goal came. WE ACTUALLY SCORED FROM A SET-PIECE. A mere year after the set-piece bingo that featured so heavily during the Aloisi era, it was fantastic to see Robbie Wielaert knocking the ball in from a Mooy delivery. Despite falling off the chair I was precariously balanced on (a re-occurrence throughout the next 90 minutes), this goal brought about the aforementioned euphoria that only a derby goal can produce. Annoyingly this lead only lasted ten minutes as Archie Thompson scored an incredibly offside goal for Melbourne Victory. It was not what we deserved and it was the kind of against the run of play goal that is incredibly demoralizing for both players and supporters. The fact that Thompson was closer to the stands then he was to the defensive line only added to the frustration. This frustration did not last long however. Channelling his 2012-13 pre-season scoring form, full-back Jason Hoffman), was able to score to give us a 2-1 lead. This was his second goal in three matches (including the last match of the 13-14 season), giving him a better return then he had in his years as an out and out striker. Bafflingly, this goal once again came from a set piece and the expected future arrival of Jesus Kennedy will only increase our newly discovered threatening nature from set plays. The half continued with chances for either side, however with only stoppage time remaining, it looked like the half was going to end with Melbourne City holding a slender, yet deserved, 2-1 lead. Just as fans were beginning to leave their seats to join the mammoth beer-queues, Victory scored a goal more sobering then the mid-strength beer about to be served. Redmayne made a reaction save from a Victory surge forward and Berisha was on hand to knock in the rebound to tie things up at 2-2. With only seconds to go until half time, conceding such a goal was devastating and really exposed the defensive problems that we unquestionably have. Despite the disappointment of conceding so late in the half, being level at half time was not as concerning as it may have been. We’d controlled the play and for a change we’d been able to turn our possession into goals. While there were unquestionably holes in defence, the fact was that the first goal we’d conceded had been offside and the second had only come about due to the defence switching off late in the half. As such, there was a sense of optimism present, especially as Villa looked like he was on the verge of taking the game by the scruff of its neck. In the second half though, with MCFC defenders spread akimbo across the field, it all fell apart as we once again conceded after a ludicrously short amount of time. I’d barely been able to balance myself back on top of my seat before Berisha was able to find way to much space and score his second goal of the night. In the space of two minutes of play, we’d managed to go from looking comfortable in the lead to being on the ropes and a goal down. Allowing goals to be conceded so close either side of half time shows a real lack of focus by the team and seemingly a lack of leadership on the field. There is little point dwelling on the rest of the second half as, to be frank, it was pathetic. They scored two more goals after some soul-crushing defending and Damian Duff got booked for toppling over in the box. Honestly, the only positive in the second half was the fact that we only lost by three goals, ensuring that we still hold the record for a derby win. To quote Harvey Dent, “the night is darkest before the dawn” and on Saturday the night was pretty damn dark. We can only put this result behind us and pray to all things sacred that we finally see the dawn this Friday vs. Adelaide United.